The National Bike Summit begins tomorrow, bringing together an estimated 750 cycling advocates. They’ll hear from NYCDOT Chief Janette Sadik-Khan, Transportation Secretary Ray LaHood, and Interior Secretary Ken Salazar, and they’ll descend on Congress in droves, plastic bike pins fastened to their lapels, to deliver a message about safe cycling access. We’ll be covering the Bike Summit like other Washington reporters cover the State of the Union. For people who care about sustainable transportation, this event is a high point of the year. As bicycling infrastructure improves, advocates refine their demands. These days, the call is not just for bike lanes, but separated bike lanes. Bike Summit attendees are sure to be talking about it. Yesterday, Streetfilms released a new video about floating parking and separated cycletracks. And last month, Harvard’s School of Public Health released a study about the superior safety of separated bike tracks. So why does the American Association of State Highway Transportation Officials still advise against cycle tracks on safety grounds? AASHTO’s design manual is the “bible” used by traffic engineers and planners around the country, along with the FHWA’s Manual on Uniform Traffic Control Devices, and it can be hard for localities to get approval — or funding — for projects that deviate from the prescriptions laid out in these guides. A group of urban transportation officials, called Cities for Cycling, has been working to update AASHTO’s Bikeway Design Standard Manual and the MUTCD for years to include better cycling infrastructure. Eric Gilliland, executive director of the National Association of City Transportation Officials, the sponsoring organization for Cities for Cycling, says the Harvard study confirms the benefits of separated bike lanes. “The trend, it seems, in bikeway planning is to provide more of a buffer between bicycle traffic and main street traffic, from a safety standpoint but also from an encouragement standpoint,” Gilliland said. Portland, in particular, has latched on to the concept of separated bike infrastructure, hoping it will attract hesitant cyclists, Gilliland said. The problem with current guidelines, Gilliland said, is that they are not updated very often and do not consider European innovations. Cities for Cycling has been working to lobby the organization to adopt some of the more cutting-edge innovations being put in place in trailblazing cities. AASHTO’s standards do allow for some interpretation by engineers. Places like New York, San Francisco, Portland and Washington have “really been pushing the envelope,” he said. But it can be tricky to use federal funds for projects that are not in the design manual. In the absence of federal design guidelines for roads and bikeways, states and localities adhere to AASHTO’s guidelines in order to show that they’re using “best practices” and to avoid liability. Cities that choose to pursue avenues that are not specifically sanctioned must also undergo a time-consuming approval process. This can be difficult for smaller cities. Cities for Cycling is working on an alternative to current guidelines. The Cities for Cycling manual will include the latest design innovations being adopted by American cities. Many of these practices have their orgins in Europe, Gilliland said, such as colored bike lanes, bike boxes and cycle signals. The group is hopeful their recommendations will be adopted for use by AASHTO and the FHWA. I am a vehicular cyclist. I believe that cyclists fare best when they behave as vehicles, and are treated as vehicles. I am not in favor of separate cycle tracks in infrastructure. Good to hear that America will soon have a manual on cycling infrastructure that AASHTO can incorporate into it’s own guidelines. I am a New Yorker. You don’t behave as if you’re driving a car when you ride the subway, and you don’t ride on the bus the same way you ride in a taxicab. Besides, even if you’re in the mood for some vehicular cycling, unless there is a bike lane on every single street, there will always be room for that style of riding. Good for you Esther Lumsdon, and continue to do as you wish. Meanwhile I, and almost every other kind of person on a bike would like a separated lane wherever possible. I should add that your freedom to join vehicular traffic is not harmed in any way by the availability of a separated bike route. First choice: Motorists who always obey the law, are never distracted and always see me. And no mistakes by me, the cyclist. In that situation, I would just ride in the road. Ideal and impossible. Second choice: Being separated from motorized traffic by physical barriers. Great, but do we need a high volume of cyclists to justify? Or, if we build it will they come? Third choice: Being separated from motorized traffic by a painted line. Not bad if we can get it. Fourth choice: Competing with motor vehicles. The status quo in most places. Actually, we fought off a proposed law in North Carolina that would have _required_ cyclists to use a bike lane if one existed. Given that some bike lanes are 18″ wide, and some are painted to the right of right-turn lanes, this proposed law was a bad idea. Also, some bike lanes in my town are on steep hills. I can hit 25 mph going downhill, and I’m not going to stay in a bike lane that is right next to a curb on a road where the speed limit is 25mph. I’m happy to stay in the bike lane when I crawl up that same steep hill. If you are vehicular cycling, you’d better ride at 25 all the time. Otherwise, you might face road rage violence from the vehicle you are holding up. The rest of us are better off in a bike lane. Numerous bike lanes, both in NY and in NC are detrimental to rider safety – or a best give a false sense of security. 6th Ave. in Manhattan comes to mind, and I will not use it. Streets are public spaces that must be safe for everyone without the armoring that automobiles have. Protected bike lanes and the 20-mph speed limit are steps in the right direction, although substantial danger still exists. So does anybody know if there is actual movement to get the AASHTO’s guidelines to allow for separated bike lanes, or just talk? Is there anybody word on when we think this can happen? It seems to be very clear that it must happen before separated bicycle lanes (and hence cycling itself) can really take off. And it seems like it would have the best chances if down under Ray LaHood’s watch, since he is very pro-bike. Look, I really like most of what NYCDoT is doing particularly with its cycletrack designs. They are really pushing the bar. However, if their designs don’t go through the rigorous testing that the FHWA requires then AASHTO really has no option but to NOT consider them. At least Portland has the fortitude to go through the testing process with its innovations which I know includes its bike boxes (which I’m still not a big fan of) and its cycletracks, just to name a few. It a real shame that Streetsblog’s coverage missed that one itsy bitsy detail. The idea behind vehicular cycling, namely that you can hop on a bike and then “drive” it just as you would an SUV, falls apart in the real world, especially in congested places like NYC. For starters, the assumption is that the cyclist already knows how to drive a car. In NYC especially, many cyclists, including myself, never bothered to obtain a driver’s license. As such, they’re clueless what to do mixing it up with cars. Second, a human-powered machine has obvious power limitations. As such, acting like a motor vehicle isn’t possible. You just can’t stop/start as often or as quickly as something with a motor. If you wish to take the traffic lane, you need to be going at least the speed limit. Even in places with a low 30 mph speed limit like NYC, this isn’t possible except downhills. In practice you’re relegated to that space on the side of the road unless traffic is very light, or you’re on a good downhill. In most cases that space isn’t particularly safe. You’re subject to dooring, bad pavement, leaves, etc. This is why the vehicular cycling concept largely failed to grow cycling despite having 30+ years to try. 99% of potential cyclists just don’t feel comfortable or safe outside of bike lanes given the reality of our streets. In theory you may be able to take the traffic lane but in practice it’s usually suicidal. As someone in that 1% who can ride almost anywhere, I’ve learned to accept this reality, and also to accept the need for separated bike lanes. I’ll also admit what we have is a compromise. Ideally, I would greatly prefer grade-separated bike lanes to either riding in traffic or in protected bike lanes. The reason is they would offer a much more stress-free ride, without the need to deal with motor vehicles, pedestrians, traffic lights, stop signs, etc. The fact that I can deal with these things in my own way is immaterial. I’d prefer not to given a choice. Vehicular cycling isn’t as bad as all that. You don’t need to go 30 mph. On ‘neighborhood’ streets with one lane in each direction, you go the speed you go and drivers pass you when able. There are always people parking, people pulling into and out of driveways, people crossing the street, so it’s not like it’s a smooth 30 mph freeway– people expect obstacles. Of course I’m thinking of a certain kind of street, and you may be thinking of a different one. I like both. Bike lanes, or better yet separated cycletracks, are great on roads with few driveways or cross streets, where there may not be on-street parking, and where traffic often goes fast, like roads through the park and suburban arterial roads. Shared streets are great in neighborhoods with housing and driveways and frequent cross streets and stop signs, where drivers can’t get up to a high rate of speed even if they wanted to. Speed bumps and bollards and other speed-limiting measures are a big benefit here. ZA, you are wrong. I believe the majority of bikers today wish to be as free as those bikers who came before us and venture out among all our fellow road-travelers. Look forward to following what happens here. We need separate infrastructure, I really don’t like the pressure to ‘keep up’ with traffic on street without facilities, even though I never go past 15mph. I would much rather have 25% of trips be made by bike and to be safer, feel safer, and see all ages represented on bicycles. In my opinion VC’s are selfish that their ‘perfect way of cycling’ with ‘optimal safety and speed’ should mean kids, elderly, and largely women be excluded from attempting to cycle. I think that both “camps” on this issue are not seeing the possibility that they are both a little right and a little wrong. “seperated lanes” are not really seperate. You still have those intersections and these have a tendency to make those problems worse. In the USA, the problem is that these have usually been nothing more than wide sidewalks. My City of Columbia, Missouri is still building those. Refusing to do the engineering or spemd the money to signalize the intersections correctly. On the other hand, vehicular cycling does leave one vulnerable to harassment and many people will not put the effort into learning the skills neccesary to ride that way. We teach a LAB course which has nearly a 100% success rate in getting people cycling but it’s very difficult to get people to take the course. I believe that a VC is going to habe a more efficient trip and that there are problems with cylcle tracks ( like making a mid-block left turn ) but the important thing is that they are done right. So I hope the people advocating for them get out of this VC vs. “seperated” argument and learn how to reduce the intersection risks. Typed on phone. Please forgive typos etc. Fortuitous timing, with NBBL suing, in part, on grounds that PPW doesn’t meet AAHSTO guidelines. I am for bike lanes which are separated from roads by a white stripe, but not curbs, greenspace, or whatever else there might be. As a cyclist who has many miles on both roads and seperated bike paths, I agree that the separated bike paths feel safer but I don’t believe perception is reality in this case. A motorist rarely scans beyond the curbs at an intersection. I’ve been hit by a car when I was riding on a bike path, and had more near misses than when in a bike lane or on the road itself. Motorists may get angry, impatient, etc with a vehicular cyclist, but few are stupid enough to do much more than honk and speed around you. I prefer them noticing you and displaying ignorance of your rights than them not noticing you and displaying ignorance of your presence. That said, I bet the divide on this issue can be split roughly by riding speed. I am generally a fast rider and from the comments and experience I would guess leisurely riders prefer the separated paths. In this issue, as with most, design is everything. All it takes is one flat to make one realize that a separate bike lane that cannot or is not cleaned by conventional street sweeping equipment is a poor idea. Not that I’m against the concept, but I have yet to find one that I would actually ride on. Separate may be safer, but rarely, if ever, is it equal. Riding speed is only part of it. Location is another. The vehicular cycling concept seems to work best on quiet country feeder roads where vehicle speeds aren’t high, traffic is light, and there aren’t a lot of traffic controls. It fails miserably on high-speed arterials and even quiet city streets. It may work OK in theory on the types of neighborhood streets mentioned by Alai. The problem in NYC is such streets generally aren’t good through routes. Moreover, they tend to be littered with stop signs and/or poorly synchronized traffic lights. If vehicular cycling is taken in its entirety, these are supposed to be treated exactly as you would if driving a motor vehicle. The problem is most cyclists just can’t start/stop that frequently, especially while maintaining an acceleration rate which keeps up with what motor vehicles typically do on these types of streets ( i.e. 0-20 mph in ~6 or 7 seconds ). This type of acceleration is often needed to keep from being seen as “impeding traffic”, even if traffic may only go 20 mph. As such, most cyclists in NYC prefer arterials, but those are mostly ill-suited to the vehicular cycling concept (see next paragraph). Why are NYC arterials typically not suited to vehicular cycling? Well, generally to do so would require keeping up with 40-50 mph traffic, or perhaps lane splitting between two lanes of such traffic. Even though I’m a fast cyclist, I can’t physically manage the former except on very rare downhills. I wouldn’t even attempt the latter given how frequently and unpredictably motorists change lanes. That basically leaves the space between parked cars and the rightmost traffic lane, otherwise known as the door zone. Sure, this is suitable for riding, when traffic conditions are light enough that one can swing into the traffic lane to avoid probable dooring situations. Forget about it the rest of the time. I’ll readily admit rush hours you might be OK on arterials when traffic might only keep a pace of 25-30 mph. I can sometimes draft larger vehicles and keep pace with 30 mph traffic. If none are present, usually the slipstream of cars is enough to keep at ~25 mph without undue effort. Then again, I’m a fairly strong cyclist. I couldn’t see a newbie being able to pull this off. Finally, a true story which shows the despite the law saying a cyclist can take the lane, even the police refuse to acknowledge this in practice. Back in the mid 1980s I was pulled over by the police once for “impeding traffic”. I got off with a warning, but the cop’s attitude was particularly enlightening. The location was Union Turnpike eastbound, where it dips under the Grand Central Parkway. For those unfamiliar, this is a nice ~4% very long downgrade. I was in an aerodynamic tuck going about 40 mph in the middle traffic lane. The far right lane was empty, but the road condition was very poor. Anyway, as the hill started leveling out, I hear sirens. At first I thought they were pulling over one of the cars which had passed me. The cop rolls down his window, tells me to pull over. After we’re both stopped, he says to me that I was impeding traffic. I tell him how could I be impeding traffic when I was going at least the speed limit (I smartly didn’t mention that I was 10 over the 30 mph limit). His “answer” was I don’t care if you’re doing 100 in a 30 zone. If you’re going slower than motor traffic wants to go then you’re impeding traffic and should pull over to let it pass. At that point he said I’m letting you off with a warning, so I saw no point continuing by mentioning the poor road condition of the rightmost lane, or the fact that I’m entitled to take the lane, or that the cars were all going 50-55 mph, well in excess of the limit, etc. It appears a bicycle in the traffic lane is almost always seen by police as “impeding traffic”. The exception might be those rare instances when motor traffic is moving slowly enough that you can keep pace. Bottom line, separate cycling infrastructure may not be needed on quiet country roads, but on NYC arterials it’s almost always a necessity in the absence of a decent shoulder ( such as the one which exists on Hillside Avenue and also Jericho Turnpike outside city limits ). I’ll grant that protected bike lanes still subject riders to hazards at intersections. That’s why long term we should aim for a bike network which is totally physically separate from arterials. You can still bike along side streets for part of the journey of course to get to these separated bike paths. It might be feasible to cost effectively make such paths in the medians of expressways. You already have the grade-separated road in place. It’s just a matter of sticking in ~12 feet of pavement for a 2-way cycling track. Many medians can accomodate this. You just need to add some means of getting on/off the cycleway periodically. I’m agreed in general with Eric and tljnyc, above. I don’t think the solution should rely entirely on creating separate facilities for cyclists, because then you’re 1) doing the same thing drivers are and riding in a bubble; 2) requiring more energy to install and maintain these separated lanes (think of sweeping and plowing); and 3) encouraging the ongoing idea by some drivers that if there is a lane/separated lane/path, you need to be there, and if there isn’t one, you shouldn’t be on the street. Great for getting people to ride, but also giving a false sense of security with these new people. Yes, you can get hit/hurt, and no, they don’t go everywhere. I feel strongly that bicyclists fare best when they are treated as drivers of … bicycles! What else could be truer? LOL. On a slightly more serious note, it is important that we not be required to use bike lanes when unsafe, and California law for the most part gives us that exception. On 14th Street downhill from Dolores, for example, I always move over into the adjacent travel lane in order to be safely away from the edge at the high speeds I pick up on that block. The lane admittedly implies to novice cyclists that’s where they should ride. A sharrow in the adjacent lane would help. The California Bicycle Coalition’s most important campaign this year is to get Caltrans to adopt (for the most part) progressive standards for cycle facilities that will allow and encourage every community in California to implement cycle tracks, bicycle-priority signals, and other innovative designs. For example, we are hoping to get Caltrans to adopt something very similar to what Cities for Cycling is likely to come up with! The street cleaning issue has been easily solved in European cities like Copenhagen: they just have small street sweepers specifically for the separated bike lanes. It’s not a big deal, and *really* should not be an issue to implementing safer bicycle infrastructure. Why has the idea of personal responsibility while driving disappeared? I realize that most collisions between cars and bicycles are due to the driver of the car not being aware of the cyclist, and we then call it an “accident”. If you operate a multi-thousand-pound piece of machinery, YOU are responsible for whatever happens with that vehicle. If you aren’t willing to accept the responsibility for killing a cyclist because you didn’t check your blind spot, you shouldn’t be driving. If you kill someone with your car, it is not an accident. It is negligence. No matter what (seriously, NO MATTER WHAT) is happening, there is no excuse for killing someone on the road. If we can plant this idea in the next generation of drivers, maybe we won’t need to worry about separating our bikeways. The Cities for Cycling initiative is a much needed design resource for practitioners who would like to implement more innovative treatments. 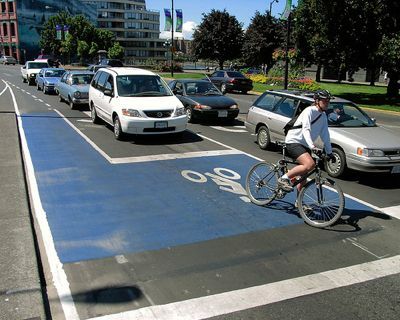 Beyond these design guidelines, cities currently experimenting with separated bikeway designs are providing a valuable opportunity to evaluate the safety and effectiveness of these types of facilities. Much of what we know now is anecdotal, or may be true for one bicyclist or location but not another – the comments above are a testament to that. One thing that’s clear is that local agency staff and the public would benefit from a comprehensive study to provide better guidance on what the exact safety issues are, how to design around them, and whether separated bikeways can really get us past to 2% bike mode share in the U.S. Thanks to all of you in D.C. this week that are lobbying for more resources for these efforts. Anyone taking the vehicular cycling VERSUS separated facilities position is being willfully ignorant or confrontational. It is not a one or the other choice. Both are needed. I’m SO over the nature of this debate. Do you think Bjarne Riis learned to ride a bike as a “Vehicular Cyclist”? Do you think his grandmother stuffs herself into Lycra (a Koch Brothers product, BTW) when she needs to head out for a “Wienerbrød”? No! They both used and continue to use the first-class bicycle facilities that Denmark has. Wanna keep cycling in the fringe? Keep up your dated attitude.